This essay is, in the vernacular of the academy, a "think-piece." I have, consequently, eschewed the standard academic conventions of lengthy footnotes and a substantial bibliography. I hope that readers will forgive this unconventional decision. I am currently working on a book-length manuscript on this theme. This work emerged out of lengthy discussions, over many Northern days and evenings, with a large number of Northern /remote regions specialists. While I do not hold them responsible for the conclusions and ideas presented herein, I would like the acknowledge my personal debt to the following individuals: Greg Poelzer, Tom Morehouse, Lee Husky, Claus Naske, Terrance Cole, Steven Haycox, Bill Morrison, Doug Nord, Geoffrey Weller, Lyn Riddett, Gurston Dacks, Bill Waiser, Jim Miller, Eric Sager, Ian McPherson, Aron Senkpiel, Shelagh Grant, Peter Jull, and John Taylor. COATES, Ken. The Rediscovery of the North: Towards a Conceptual Framework for the Study of Northern/Remote Regions. 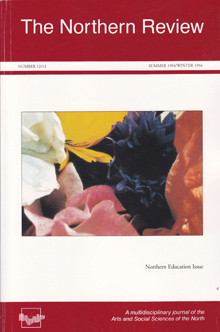 Northern Review, [S.l. ], n. 12/13, p. 15-43, 1994. ISSN 1929-6657. Available at: <https://thenorthernreview.ca/index.php/nr/article/view/254>. Date accessed: 22 apr. 2019.